Author Howard Engel suffered a small stroke in 2000, causing him to develop alexia sine agraphia, or the ability to write but not read. Drawing from his own experience he gives the disorder to his main character, Benny Cooperman, who wakes up in a hospital bed having no idea where he is and how long he's been there. Cooperman's short-term memory is shot, but his long-term is still working. He has no idea what happened, what situation he was in before he received his head injury, or for whom he was working as a private investigator from a small city outside Toronto at the time he was hit on the head. The whole episode is gone, save a surreal dream in which he's on a train that flies off the tracks, flipping over and over, causing a piece of luggage to hit him in the head. None of that happened to Benny in reality, making reconstructing events that much harder. But deep down he believes that dream means something. Sounds like a great idea for a novel, made more intriguing by the knowledge the author himself went through the same experience, clawing his way back by strength of will. I had to respect Howard Engel, giving him full credit for working to get back to writing when some would have given up. The plot of the mystery is nonsense, connected by strands of cotton candy floss. That Benny's able to reconstruct things from his fractured memory, and how he does it, is ridiculous. 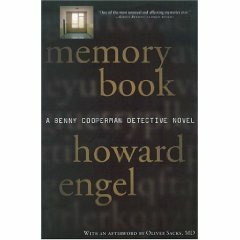 The intriguing part is learning how Engel regained his own ability to read, what effort it took, and roughly how long it may have taken - judging by a vague sense of how long Benny Cooperman spends in the hospital, recovering to the extent he can take care of himself and go back home. Realizing Engel was a detective mystery novelist before his stroke, I can see why he'd yearn to return to the genre after his recovery. But the book falls flat on its face. What should have been an autobiographical work about his stroke and recovery is instead a very bad detective mystery novel. Not having read his earlier work I don't know how this book compares. After my experience with this book I won't be reading his others. Respecting the author for his strength of will doesn't equate to the automatic enjoyment of his work. I finished the book, since it was so short, in hopes the denouement would be worth the effort. But it wasn't. I applaud him for struggling back, and wish him continued health, but bad writing is bad writing. I can't help thinking of the author who wasn't published because this man was, someone with a quality manuscript ignored because the author of a detective series wanted to publish a sub-par book. I cringe at the waste of it. Writing isn't about the author; it's about the work. And this work was a disappointment. * I read my library's copy of this book. Next Post The story of a saucy wench, or that’s why the lady’s a tramp.